Are you seeking for ways and means to make your windows spotless yet again? Do you want to know how to skip unpleasant tasks like window cleaning without lifting a finger? You have chosen the right assistance – the experts of window cleaning in Somers Town will take care with this matter in short time. Your windows along with their framework and sills will look perfect, we guarantee that! You will no longer have to give up your spare time – the results of our work will fully fulfil you. Our services merge first-class quality with reasonable price rates, so don't procrastinate – request an estimate now to save time, effort and money! We also provide our professional services in nearby areas: Primrose Hill, Marylebone, Chalk Farm, Camden Town, Camden. We provide private and business window cleaning by using efficient techniques. You can rely on our skills for all types of glass surfaces, skylights and greenhouses. For windows placed as high as the fourth floor, we use water-fed extension poles. This procedure is convenient and allows risk-free cleaning systems – the poles are connected to the water supply in the vehicle. For higher windows, our rope access team will grant you quick and effective end results. You can profit from these methods right now – just dial 020 3746 3113 and book a window cleaner! You can count on the cleaners for both domestic and commercial window cleaning. All types of glass surfaces are included in our professional routine. For instance, you can get a service for cleaning small or double windows, sash ones, French doors, patio doors and bay windows. Besides these, we wash and polish garden window surfaces, greenhouses and skylights. At home or at the office, you can always have crystal clear glass surfaces – just contact us! We have the skills and the right techniques for the assignment. We guarantee that the windows of your office will be neat and spot-free, like new. Achieve that by just booking our commercial window cleaning. For glass surfaces as high as the fourth floor, we utilise water fed extension pole equipment which is completely safe and reliable. London is famous for it's tall buildings. So when it comes to those high-rised windows we will bring our rope access team. With this sophisticated method, we can give you results like no other! 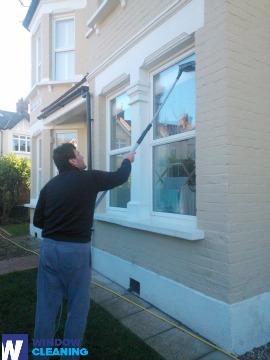 Hire us for window cleaning in Somers Town for your residence. We will use previously mentioned methods – water fed extension pole system for easy-to-reach windows and rope access tools for the high-rise ones. For the whole service we use purified water. Request a cleaner today – call 020 3746 3113 and get in touch with our representatives. Or just fill in our online booking form or use our chat feature. The nearest tube station serving NW1 Somers Town is Mornington Crescent.